Almond oil is pressed from whole almonds. It is available refined, unrefined, roasted, and unroasted. Almond oil most suitable for use in food is typically referred to as sweet almond oil (rather than bitter). Almond oil is typically 70% monunsaturated oleic acid, 21% polyunsaturated linoleic acid, 5% palmitic acid and 3% stearic acid (both saturated). 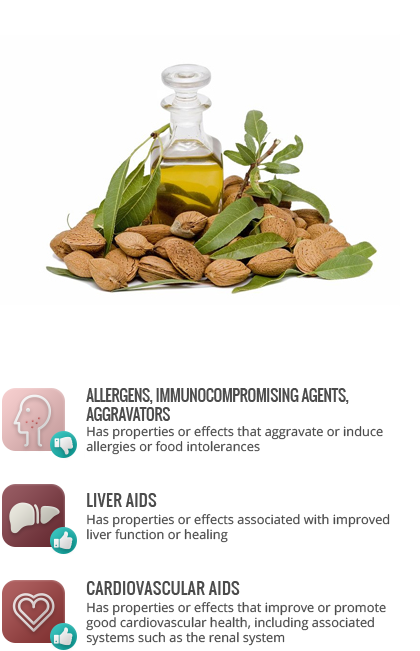 In rats, almond oil intake improved the signs and symptoms of fatty liver. A study in which a portion of fat intake in healthy men and women was replaced either with whole almonds or almond oil found them to both be equally effective in decreasing triglycerides, total cholesterol, and LDL (“bad”) cholesterol, as well as increasing HDL (“good”) cholesterol. See: Monunsaturated fat, Polyunsaturated fat, Oleic acid, Linoleic acid. Refined oils have fewer antioxidants than unrefined oils. Almond oil has a relatively high smoke point of 420 degrees fahrenheit, but its delicate flavour is best when used cold as a finishing oil. Almond oil may contain allergenic almond proteins. Macaroons, marzipan, nougat, almond butter, East Asian and Asian desserts. In almonds and almond flour.